Oooooooh…. 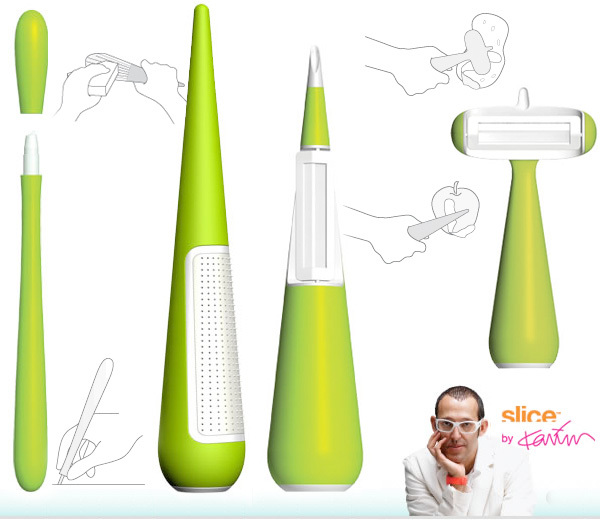 so while i do love my xacto knives ~ i’m extremely intrigued by the new Slice by Karim Rashid products… first found them over at Unica Home, and found more info at the Slice website. Slice is all about ceramic blades ~ “Compared to any metal (even high-carbon steel), ceramic is sharper, harder, and stays that way longer.” ~ and the Precision Cutter is great for an xacto replacement apparently… and only 7$? 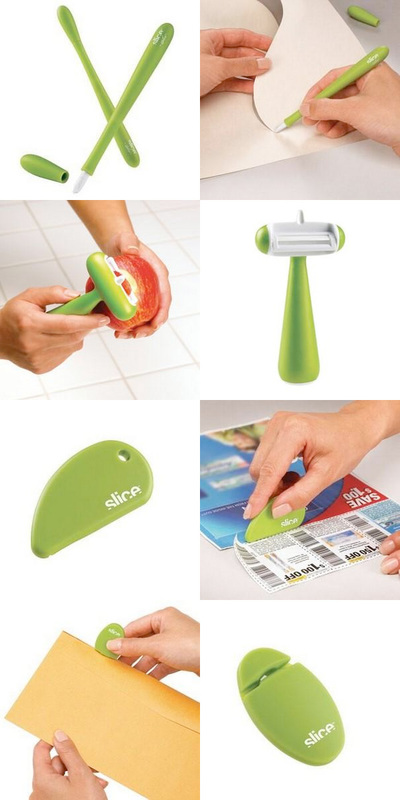 So it looks like Slice originally had its letter opener and safety cutter ~ and in collab with Karim, they now have the Precision Cutter, Veggie Peeler, Y-peeler, and Grater ~ all so tempting! See some more pics i found at Unica on the next page! I bought a Slice Precision Cutter and it the little white plastic cutter holder part broke off when I gently put the lid on for the first time. As an industrial designer I am extremely disappointed with this product. So I guess this Karim guy is gonna beat the smooth conical form until it’s dead. Using the same form for another product may be smart. But you are a re-former. I think its great that ceramic knives (/ cutting stuff) are becoming more popular. I have used one and they are awesome. However, I think the design is a bit on the flashy side (as I believe most if not all of Karim’s work is) and I hope they have some kind of rubber-y texture on the grip. For the record, I love the Chef´n palm held peeler. It may be that I´m biased by that. the designs actually make them look safer to use than normal knives. or is that just me? …I love Karim…..but pink is better!!!!! I feel like murdering someone with one of those! Dude… where is the CD opener? Love the clean design.. and the price ! I love the design. Its a practical and beautiful object!